The emergence of data-driven services in the Internet of Things provides manufacturers of technical products the opportunity to become providers of services, which use data as primary input. The development of such smart services, however, is characterized by high complexity and uncertainty. To identify service ideas which are worth to pursue further, the potential financial impact is an important criterion. While the importance of a business case is acknowledged in service engineering, there is currently no concrete method that is integrated with the early design phases of smart services. Therefore, we propose a tool-based method for the design-integrated financial assessment of smart services. We use a design science research approach to develop a meta-model, which is implemented in a web-based tool. The experimental evaluation shows that the proposed tool provides benefits, especially in structuring the task for project teams. Therefore, it appears to be beneficial to provide interdisciplinary teams a tool-based support for the design and evaluation of smart services. O320: Management of Technological Innovation and R&D L86: Information and Internet Services • Computer Software. O14: Industrialization • Manufacturing and Service Industries • Choice of Technology. Alam, I., & Perry, C. (2002). A customer-oriented new service development process. Journal of Services Marketing, 16(6), 515–534. https://doi.org/10.1108/08876040210443391. Aurich, J. C., Fuchs, C., & Wagenknecht, C. (2006). Life cycle oriented design of technical product-service systems. Journal of Cleaner Production, 14(17), 1480–1494. https://doi.org/10.1016/j.jclepro.2006.01.019. Baines, T. S., Lightfoot, H. W., Evans, S., Neely, A., Greenough, R., Peppard, J.,. . . Wilson, H. (2007). State-of the-art in product-service systems. Proceedings of the Institution of Mechanical Engineers, Part B: Journal of Engineering Manufacture, 221(10), 1543–1552. https://doi.org/10.1243/09544054JEM858. Becker, J., Beverungen, D., Knackstedt, R., & Müller, O. (2009). Model-based decision support for the customer-specific configuration of value bundles. Advance online publication. https://doi.org/10.18417/emisa.4.1.3. Böhmann, T., Leimeister, J. M., & Möslein, K. (2014). Service systems engineering. Business & Information Systems Engineering, 6(2), 73–79. https://doi.org/10.1007/s12599-014-0314-8. Brady, M. K., & Cronin, J. J. (2001). Customer orientation. Journal of Service Research, 3(3), 241–251. https://doi.org/10.1177/109467050133005. Caulkins, J. P., Morrison, E. L., & Weidemann, T. (2007). Spreadsheet errors and decision making. Journal of Organizational and End User Computing, 19(3), 1–23. https://doi.org/10.4018/joeuc.2007070101. Cavalieri, S., & Pezzotta, G. (2012). Product–Service Systems Engineering: State of the art and research challenges. Product Service System Engineering: from Theory to Industrial Applications Product Service System Engineering: from Theory to Industrial Applications, 63(4), 278–288. https://doi.org/10.1016/j.compind.2012.02.006. Columbus L (2017) Internet Of Things Market To Reach $267B By 2020. https://www.forbes.com/sites/louiscolumbus/2017/01/29/internet-of-things-market-to-reach-267b-by-2020/#c5804d609bd6. Accessed 18 September 2017. Craven, M. P., Morgan, S. P., Crowe, J. A., & Lu, B. (2013). Deploying a spreadsheet tool for early economic value assessment of medical device innovations with healthcare decision makers. Journal of Management & Marketing in Healthcare, 2(3), 278–292. https://doi.org/10.1179/mmh.2009.2.3.278. Edvardsson, B., Tronvoll, B., & Gruber, T. (2011). Expanding understanding of service exchange and value co-creation: A social construction approach. Journal of the Academy of Marketing Science, 39(2), 327–339. https://doi.org/10.1007/s11747-010-0200-y. Georgakopoulos, D., & Jayaraman, P. P. (2016). Internet of things: From internet scale sensing to smart services. Computing, 98(10), 1041–1058. https://doi.org/10.1007/s00607-016-0510-0. Kim, S., Son, C., Yoon, B., & Park, Y. (2015). Development of an innovation model based on a service-oriented product service system (PSS). Sustainability, 7(11), 14427–14449. https://doi.org/10.3390/su71114427. Kim, K.-J., Lim, C.-H., Heo, J.-Y., Lee, D.-H., Hong, Y.-S., & Park, K. (2016). An evaluation scheme for product–service system models: Development of evaluation criteria and case studies. Service Business, 10(3), 507–530. https://doi.org/10.1007/s11628-015-0280-3. Kortuem, G., Kawsar, F., Fitton, D., & Sundramoorthy, V. (2010). Smart objects as building blocks for the internet of things. IEEE Internet Computing, 14(1), 44–51. https://doi.org/10.1109/MIC.2009.143. Laudien, S. M., & Daxböck, B. (2016). The influence model of the industrial internet of things on business model design: A qualitative-empirical analysis. International Journal of Innovation Management, 20(08), 1640014. https://doi.org/10.1142/S1363919616400144. Lim, C.-H., Kim, M.-J., Heo, J.-Y., & Kim, K.-J. (2015). Design of informatics-based services in manufacturing industries: Case studies using large vehicle-related databases. Journal of Intelligent Manufacturing, 50(4), 181. https://doi.org/10.1007/s10845-015-1123-8. Lin, F.-R., & Hsieh, P.-S. (2011). A SAT view on new service development. Service Science, 3(2), 141–157. https://doi.org/10.1287/serv.3.2.141. Luong, N. C., Hoang, D. T., Wang, P., Niyato, D., Kim, D. I., & Han, Z. (2016). 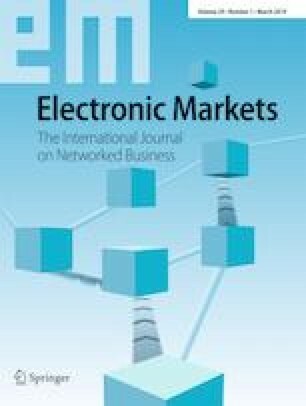 Data collection and wireless communication in internet of things (IoT) using economic analysis and pricing models: A survey. IEEE Communication Surveys and Tutorials, 18(4), 2546–2590. https://doi.org/10.1109/COMST.2016.2582841. Maglio, P. P., & Spohrer, J. (2013). A service science perspective on business model innovation. Industrial Marketing Management, 42(5), 665–670. https://doi.org/10.1016/j.indmarman.2013.05.007. March, S. T., & Smith, G. F. (1995). Design and natural science research on information technology. Decision Support Systems, 15(4), 251–266. https://doi.org/10.1016/0167-9236(94)00041-2. Marilungo, E., Coscia, E., Quaglia, A., Peruzzini, M., & Germani, M. (2016). Open innovation for ideating and designing new product service systems. Procedia CIRP, 47, 305–310. https://doi.org/10.1016/j.procir.2016.03.214. McKay, A., & Kundu, S. (2014). A representation scheme for digital product service system definitions. Advanced Engineering Informatics, 28(4), 479–498. https://doi.org/10.1016/j.aei.2014.07.004. Medina-Borja, A. (2015). Editorial column—Smart things as service providers: A call for convergence of disciplines to build a research agenda for the Service Systems of the Future. Service Science, 7(1), ii–iv. https://doi.org/10.1287/serv.2014.0090. Neely, A. (2008). Exploring the financial consequences of the servitization of manufacturing. Operations Management Research, 1(2), 103–118. https://doi.org/10.1007/s12063-009-0015-5. Peffers, K., Tuunanen, T., Rothenberger, M. A., & Chatterjee, S. (2007). A design science research methodology for information systems research. Journal of Management Information Systems, 24(3), 45–77. https://doi.org/10.2753/MIS0742-1222240302. Porter ME, Heppelmann JE (2014) How smart, connected products are transforming competition. Harvard business review. Retrieved from https://hbr.org/2014/11/how-smart-connected-products-aretransforming-competition. Sakao, T., & Lindahl, M. (2012). A value based evaluation method for product/service system using design information. CIRP Annals - Manufacturing Technology, 61(1), 51–54. https://doi.org/10.1016/j.cirp.2012.03.108. Shaw N (2014) Looking ahead: Is this the future? Canyon reveal new project bike. http://enduro-mtb.com/en/looking-ahead-is-this-the-future-canyon-presents-a-new-project-bike/. Accessed 25 November 2016. Tukker, A. (2004). Eight types of product–service system: Eight ways to sustainability? Experiences from SusProNet. Business Strategy and the Environment, 13(4), 246–260. https://doi.org/10.1002/bse.414. Vasantha, G. A. V., Roy, R., Lelah, A., & Brissaud, D. (2012). A review of product-service systems design methodologies. Journal of Engineering Design, 23(9), 635–659. https://doi.org/10.1080/09544828.2011.639712. Velamuri, V. K., Bansemir, B., Neyer, A.-K., & Möslein, K. M. (2013). Product service systems as a driver for business model innovation: Lessons learned from the manufacturing industry. International Journal of Innovation Management, 17(01), 1340004. https://doi.org/10.1142/S1363919613400045. Visnjic I, Jovanovic M, Neely A, Engwall M (2016) What brings the value to outcome-based contract providers? : Value drivers in outcome business models. International Journal of Production Economics. Advance online publication. https://doi.org/10.1016/j.ijpe.2016.12.008. Weinberger M, Bilgeri D, Fleisch E (2016) IoT business models in an industrial context. at - Automatisierungstechnik 64(9). https://doi.org/10.1515/auto-2016-0054. Wortmann, F., & Flüchter, K. (2015). Internet of things. Business & Information Systems Engineering, 57(3), 221–224. https://doi.org/10.1007/s12599-015-0383-3. Wuenderlich, N. V., Heinonen, K., Ostrom, A. L., Patricio, L., Sousa, R., Voss, C., & Lemmink, J. G. A. M. (2015). “Futurizing” smart service: Implications for service researchers and managers. Journal of Services Marketing, 29(6/7), 442–447. https://doi.org/10.1108/JSM-01-2015-0040. Yang, X., Moore, P., Pu, J.-S., & Wong, C.-B. (2009). A practical methodology for realizing product service systems for consumer products. Computers & Industrial Engineering, 56(1), 224–235. https://doi.org/10.1016/j.cie.2008.05.008. Yoo, Y., Henfridsson, O., & Lyytinen, K. (2010). The new organizing logic of digital innovation: An agenda for information systems research. Information Systems Research, 21(4), 724–735. https://doi.org/10.1287/isre.1100.0322.